These are the piping bags which we use in our kitchen day in day out! We wouldn't be without them. 533mm (21'') measurements of each bag. No washing reusable bags, waiting for them to dry! No couplers for attaching nozzles, simply snip off the end of the bag, pop in one of our favourite nozzles and start piping! You can be confident that all our nozzles work in these bags - we've already tested them for you! 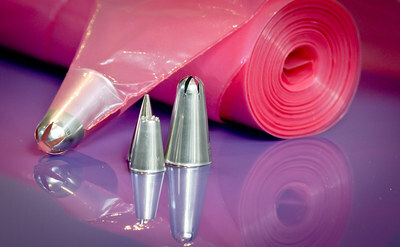 24 disposable piping bags. I am sure we don't need to tell you the nozzle isn't included! Colour might vary - pink or blue.